Are you sick of it yet? Feeling inadequate, feeling untethered, feeling like there is more, but you can’t figure out where? Do you feel like your destined for more meaningful work? Put it into perspective and discover how to maximize your value by taking our Career Persona quiz. It’s difficult in a world where reality is augmented, virtual and created, where everyone’s opinion becomes “fact” and facts are well, a matter of opinion. And in all of this noise, there you are, trying to move forward to find your best self. The word ‘real’ is the root of reality, and since your reality should be positive and nurturing, there is no reason to stand around waiting for the world to catch up. It won’t, simply because our society is made up of a whole lot of other people trying to find their best reality. Accepting that it’s okay to focus on yourself is step one. Now, let’s move on to figuring out how to create your best reality. Who are you really? Are you showing up every day, personally and professionally, as your most authentic self? Or are you adjusting and changing to suit someone else’s idea of success? Our reality is adjusted for us early on, usually by parents and teachers who, with the best intent, want us to succeed in the way they see fit. Then you get into the big leagues of reality adjustment – the workplace. Working has changed significantly and while meetings are still considered the number 1 time waster, technology has made it so that you don’t have to unplug. You are basically “on-call” 24 x 7 and now the expectation is that you are available during holidays and vacations. Spending all that time working means one thing – you must get real about your purpose and passion in order to feel successful. Otherwise your reality will bite. 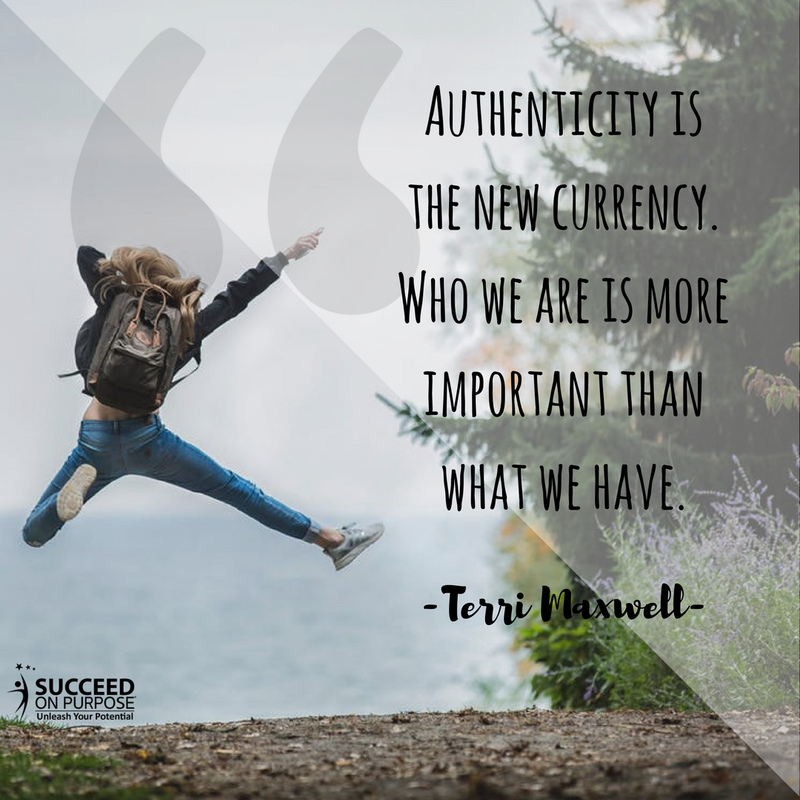 Not ‘authentic’ the buzzword where you show up being “authentically” how someone else wants to see you, but the real you. This requires a simple but powerful process of learning and absorbing your purpose. When I found my purpose, and received my purpose statement, my life immediately clicked into place. It was a visceral experience. I could feel down to my core how my purpose would impact everything I did, from my career, to my choices, to my personal life. And it did. It also made me much more authentic because now I had the words and emotions to go with who I am. I make decisions from a state of clarity and can maneuver situations, good and bad, to ensure that I stay on track. How often have you been inspired to make changes, either from hearing a fabulous speaker or attending a course or workshop, only to find you return to the same old routine? It’s comfortable, and change is considered hard. Here’s the truth – change is only hard if you don’t give yourself permission. Change means that other people might be inconvenienced or even disappointed in you. It means that you toss away things that are not working, even if you’ve had them a long time. It means you invest in yourself first, and sometimes that’s harder to do than you think. By giving yourself permission, and having your purpose, you can make real progress and move toward the reality you want for yourself! Sure, there will be times you are fearful, and times you backslide, but that’s OK. What is important is that you embrace your reality and live it every day. Step 1 – Get Real by Finding Your Purpose. Step 2 – Become More Authentic by Assimilating Your Purpose. Step 3 – Give Yourself Permission to Keep Moving Forward. Now, get started on your reality and creating the life, and the career, you truly want! If you are ready to fast track finding your reality, contact us and let’s get started!